The magic of Spottacus struck again this last week. On Tuesday, the music history Renaissance midterm hit full force- striking fear into the hearts of students and exhaustion into me. That’s a lot of grading. Corey and Mark cuddle Spottacus after the Exam. In my haste, I’d forgotten to grab my giraffe on my way to class. The absence of giraffe was duly noted by students and deemed unacceptable. My student Joey was the most vocal. 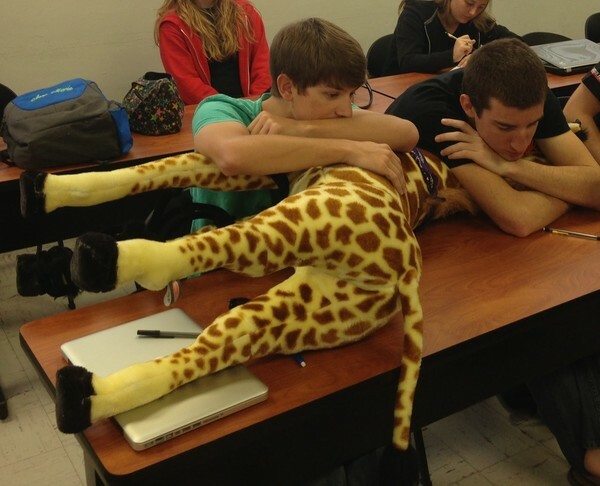 He said that he COULD NOT DO THE MIDTERM without a GIRAFFE STARING AT HIM. Spottacus was quickly retrieved and the midterm began. 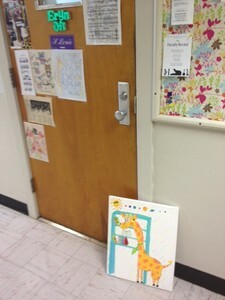 A Giraffe Painting Waits Outside my Studio Door. After the exam a funny thing happened, as the students finished they went to pet the giraffe. Styling the mane and brushing the fur with their hands. They were letting go and relaxing- and the Giraffe was part of that. I continued to collect papers and answer questions. And when I looked again Spottacus was being cuddled by Mark and Corey (or maybe used as a life preserver). I am still not sure. But it appears that Spottacus resonates more than even I understand, at times. Later I went to my studio and outside my door there was a painting of Spottacus waiting for me.